Drop off location is at the WAHA Telemedicine waiting room located at…. 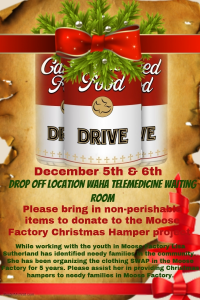 Please bring in non-perishable items to donate to the Moose Factory Christmas Hamper project. While working with the youth in Moose Factory Lisa Sutherland has identified needy families in the community. She has been organizing the clothing swap in the Moose Factory for 5 years. Please assist Lisa in providing Christmas hampers to needy families in Moose Factory.